If you want to use beef liver a trick to release any toxins that were stored in the liver and remove some of the pungent smell is to place the thawed and drained liver in a container with about 2 tablespoons of apple cider vinegar and refrigerate overnight. I also do this for the calf liver. Break up the liver in a food processor but don’t completely puree it. Place in a large bowl and thoroughly mix together with the remaining ingredients. If you want to bulk them up even more you can add about a cup of whole oats or cooked brown rice. Shape into 1 inch meatballs. I usually use a cookie scoop to get a uniform size but using your hands is just as easy.. They are a bit on the loose side but they do firm up as they bake. Bake in a baking sheet with sides to catch the juices at 350 degrees for about 30 minutes. I like to line the sheet with a silpat or parchment paper for easy clean-up. Once they have cooled use a dull knife or spoon to scrape off any remaining fat drippings. Kirby knows the smell of liver baking and always knows it's for him so he stays in the kitchen until the taste test. I suppose he's dreaming of that anticipated bite. These dumplings will keep in an air tight container up to a week and in the freezer for several months. I make batches of Kirby's meals so I'll freeze these in 1 cup containers with 4 meatballs and some extra beef broth. 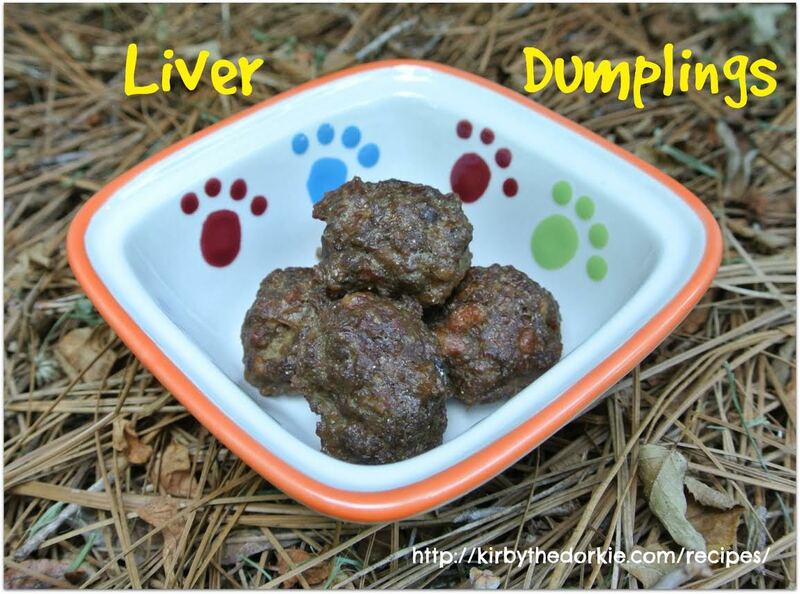 What do you think of this tasty liver treat for dogs? Let us know in the comments!